When heavy storms struck Acadia parish earlier this month, the town of Rayne was hit particularly hard. 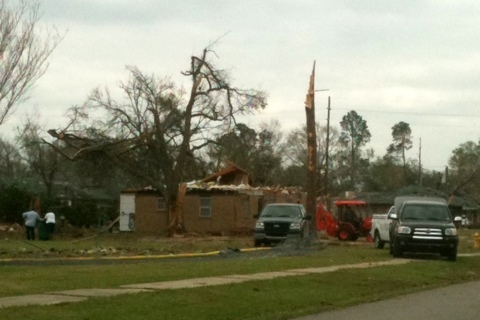 Hundreds of homes and businesses were damaged as a tornado carved a 3 mile path through the city. RTA has since been active in the recovery effort. At this time, we are focused on addressing critical housing needs that are preventing people from returning to their homes. These range from destroyed walls and roofs, to minor damage such as broken windows and electrical problems. We are currently seeking monetary donations, in-kind donations of roofing materials, general lumber, and home hardware, and volunteers to join us in the recovery effort. Click here for information on making a donation. If you are interested in volunteering, you can learn more about how to get involved here.